Peace and blessings be upon his family, upon his companions and upon all of those who pursue his straight path until the Day of Judgment. Two types of people have caused and continue to cause problems for Muslims and Islamic call. One group are those who are ignorant, they speak when they should not speak; they act upon or do that which they should not do nor act. With this they give a pretext to others to speak against Islam. The other group is people of knowledge, who stay silent when they should speak, or they do not act where they suppose to act. This group also causes problems for Muslims and the call of Islam, for silence in most cases is an endorsement of what is said. النبي -صَلَّى اللَّهُ عَلَيْهِ وَسَلَّمَ-قال: (‏خَيْرُ يَوْمٍ طَلَعَتْ عَلَيْهِ الشَّمْسُ يَوْمُ الْجُمُعَةِ فِيهِ خُلِقَ ‏‏ آدَمُ ‏ ‏وَفِيهِ أُدْخِلَ الْجَنَّةَ وَفِيهِ أُخْرِجَ مِنْهَ) [مسلم. قـال النبي صلى الله عليه وسلم: (( إن من أفضل أيامكم يوم الجمعة فأكثروا علي من الصلاة فيه فإن صلاتكم معروضة)) الحديث[رواه أبو داود]. (( الصلوات الخمس والجمعة إلى الجمعة كفارات لما بينهن)) [رواه مسلم]. In fact there are many hadiths regarding the Friday’s blessings, but which thing is most important during this day? Is it the two rakat of prayer which we pray instead of four rakats of Dhohr prayer, or the speech, khutbah which the Imam performs in this time? If in fact the importance of Jummah is only salat, we then in fact pray less rakats then the salat of Dhuhr. The importance of Jummah stands on the speech, otherwise called khutbah. Unfortunately its importance has disappeared amongst Muslims, which they have broken this day where they lose time from work and losing their life time together! جاء في الصحيحين عن أبي هريرة – رضي الله عنه أن رسول الله صلى الله عليه وسلم قال : (( من اغتسل يوم الجمعة غسل الجنابة ثم راح فكأنما قرب بدنة ومن راح في الساعة الثانية فكأنما قرب بقرة ، ومن راح في الساعة الثالثة فكأنما قرب كبشاً أقرن ، ومن راح في الساعة الرابعة فكأنما قرب دجاجة ، ومن راح في الساعة الخامسة فكأنما قرب بيضة ، فإذا خرج الإمام حضرت الملائكة يستمعون الذكر . Therefore, the importances of Friday prayer stand on the observance and carefully listening the khutbah delivered by the imam, such as are angels present listening carefully the khutbah! Where is our Jammat during the time when the imam begins the speech? 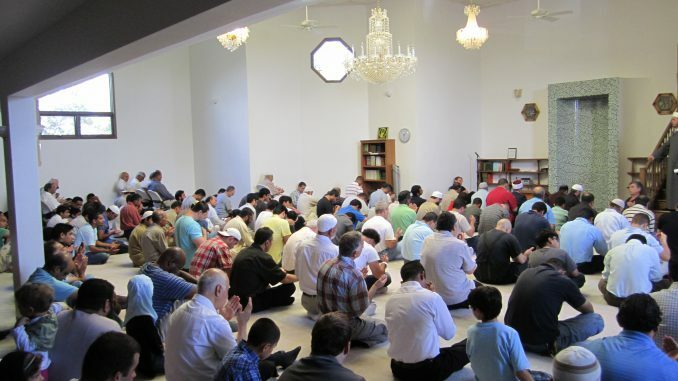 Are they outside or inside the prayer room? Outside performing idle and useless talk, most of the time talking nonsense, horsey and backbiting, or smoking and drinking coffee or eating donuts! Allah has made obligatory a certain thing, but the Muslims do not know how to value it nor to exploit it! Indeed a Muslim does not deny God’s arguments, but he ignores them by not paying proper attention. What good is a student who goes to school, but learns nothing? What benefit has a worker, who goes to work, but does not produce a single work? And what benefit has a Muslim, which goes to the Mosque on Friday, and does not profit from it? Is there a difference among these people, and the example which God has given us? May Allah protect and guide us to our best. Let us once again turn to some of the Prophets hadiths in connection with the virtues, role and importance of Friday, with a good wishes that hadiths to enter our heart and in our minds that they may serve to repair and correct our problems and negligence towards this important day, in which if we understand it correctly and if we implement it right, then in the midst of Muslims will shine the light of culture, civilization, development, peace, unity, tolerance, kindness and so on. Praise be to Allah, everything yearns for Friday, except men, which continuous to be stubborn, comes to Jummah without any purpose, simply just to pass time. To take advantage of this day and kindness of God we must, when we leave our houses to make an intention that we are going to the Mosque to listen with attention the khutbah, to learn from that and try to put it into practice in our daily lives, in our families, in schools, while we are on the road and wherever we’ll might be. If we don’t come with a good intention to the Mosque, then we have lost the functioning of this day. So important is to listen to the speech with all your attention that even, touching or telling your brother next to you “be quiet” is prohibited. إذا قلت لصاحبك يوم الجمعة أنصت والإمام يخطب فقد لغوت. البخاري. Is idle talk allowed during prayer? No, it is not allowed. The speech or the khutbah during Jummah is like the prayer (salat) according to scholars, in which vain and useless talk is prohibited. While us, not only we keep our phones on, but we talk on cell phones while the imam delivers the khutbah. Is our Jummah in order? May Allah forgive our mistakes! Brothers and sisters, don’t we see all the goodness the Jummah has, in which Allah has given to His servants? Should a smart and wise man cease from that? For what we should not be cautions on this day, to come early at the Mosque if time permits us, to read Surah Kahf, to mention Allah, to send greetings to our beloved Prophet, to pray for our problems?